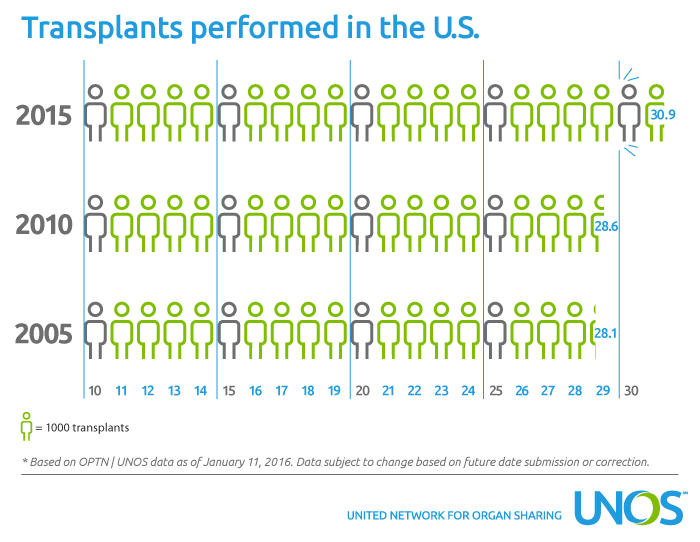 Organ transplants performed in the United States in 2015 exceeded 30,000 for the first time annually, according to preliminary data from United Network for Organ Sharing (UNOS). UNOS serves as the Organ Procurement and Transplantation Network (OPTN) under federal contract. “This landmark achievement is a testament to the generosity of the American public to help others through donation, and their trust in the transplant system to honor their life-saving gift,” said OPTN/UNOS President Betsy Walsh, J.D. Several months in 2015 marked all-time monthly records for deceased organ donation. July 2015 was the highest-ever monthly total, with 848 donors reported. The proportion of African-American and Hispanic deceased donors increased from 2014 to 2015. In 2015, 16.3 percent of deceased donors were African-American and 13.6 percent were Hispanic. Caucasian donors in 2015 (5,973) increased numerically over 2014, but decreased as a proportion of all donors from 66.5 percent in 2014 to 65.8 percent in 2015. The number and proportion of African-American and Hispanic transplant recipients increased substantially. In 2015, 6,753 (21.8 percent) of transplant recipients were African-American and 4,804 (15.5 percent) were Hispanic. African-American and Hispanic candidates account for a significant proportion of the national waiting list for kidney transplants, which is the most commonly needed organ type. The number (17,184) and proportion (55.5 percent) of Caucasian transplant recipients decreased slightly in 2015 when compared to the previous year. Transplants continue to increase from donors upon cardiovascular death (DCD) as opposed to brain death. In 2015, 2,746 transplants were performed involving organs from DCD donors, accounting for 8.9 percent of all transplants. 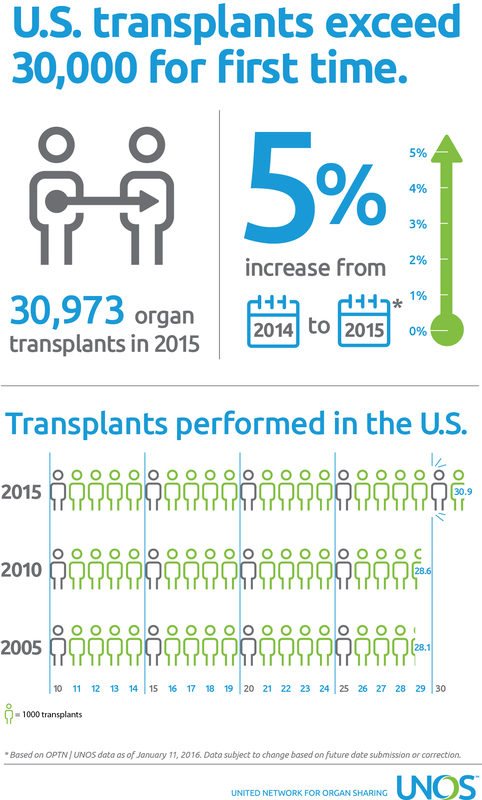 While the 5,986 living donor transplants in 2015 remain below all-time records, they represent an increase of nearly 2.9 percent over 2014. The proportion of living donors older than 50 increased slightly, with a slight decline in the proportion of living donors between the ages of 18 and 34. “We work every day to give as many people as possible an opportunity for renewed life and health through transplantation,” said Brian Shepard, UNOS’ Chief Executive Officer. “These trends are encouraging, and they make a huge difference not only for transplant recipients but for many more people whose lives they touch. But we have much more work to do to meet the needs of more than 121,000 men, women and children who continue to wait for a transplant.